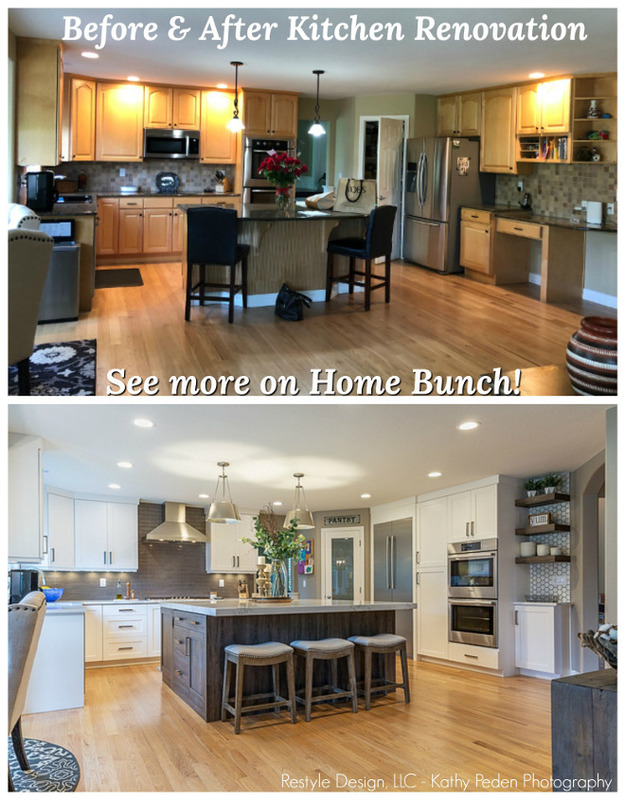 Homes built by Timber Trails Development Company and designed by Julie Howard (previously featured here – a must-see post!, here, here, here, here, here & here) always become very popular whenever I share them here on Home Bunch or on my Instagram. You fall in love with this home the moment you open the front door. 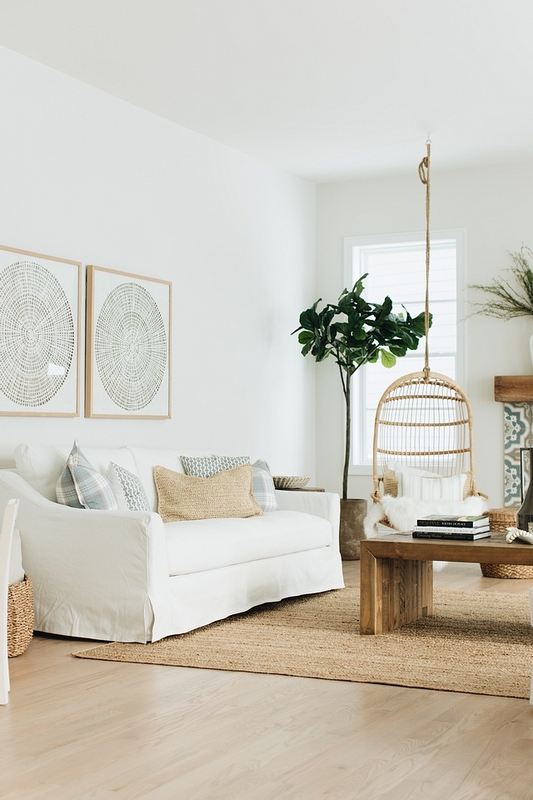 The color scheme and decor feels coastal without being theme-y. Light fixture – Joss and Main. Rug – Persian – one of kind – Others: here, here (washable rug) here, here, here, here, here, here & here. Ottomans – 610 Home – similar here. “Benjamin Moore OC-23 Classic Gray”. Artwork – Homegoods – Other Affordable Framed Artwork: here, here, here & here. 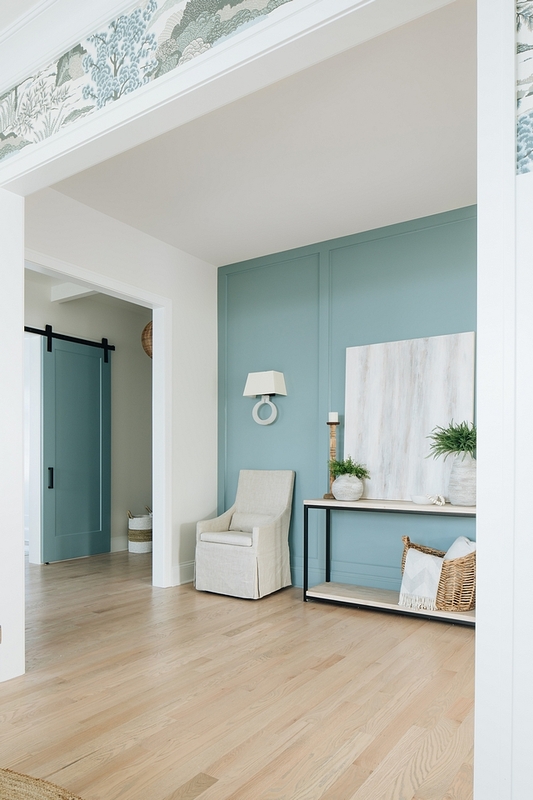 These barn doors are custom, painted in “Benjamin Moore AC-23 James River Gray”. They add so much personality to this home! Beautiful Barn Doors: here, here & here. 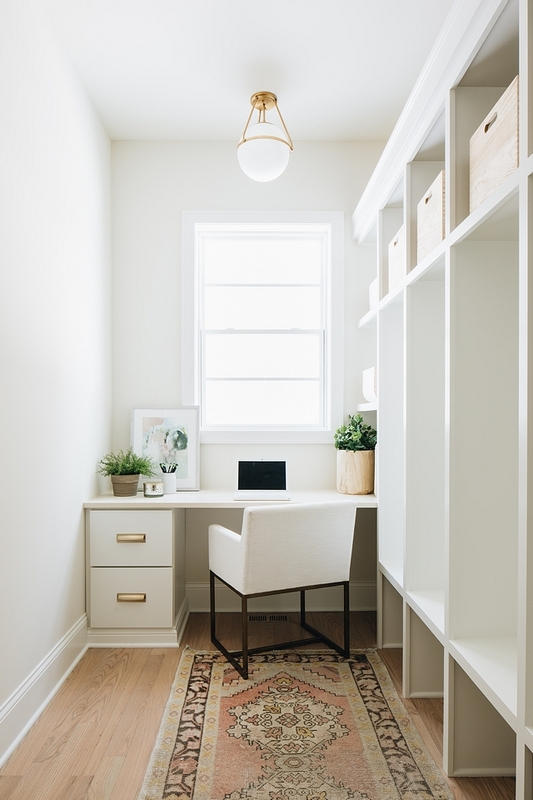 This gorgeous home office features board and batten paneling and a blue ceiling. 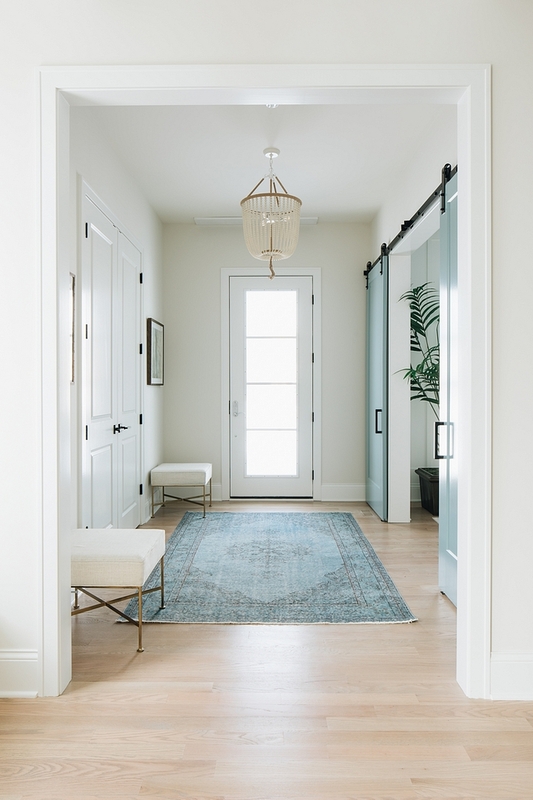 Accessories – Target – Other Accessories by Joanna Gaines: here, here, here, here, here & here. Hardware – Emtek in flat black. The two rattan chairs are from Ikea and they are black. The designer had the painters paint them white – Similar chairs: here, here, here, here, here, here & here. Plants – Walter E. Smithe – similar here. The desk is from World Market (great price!). Fabric chair -RH – similar here, here, here & here. 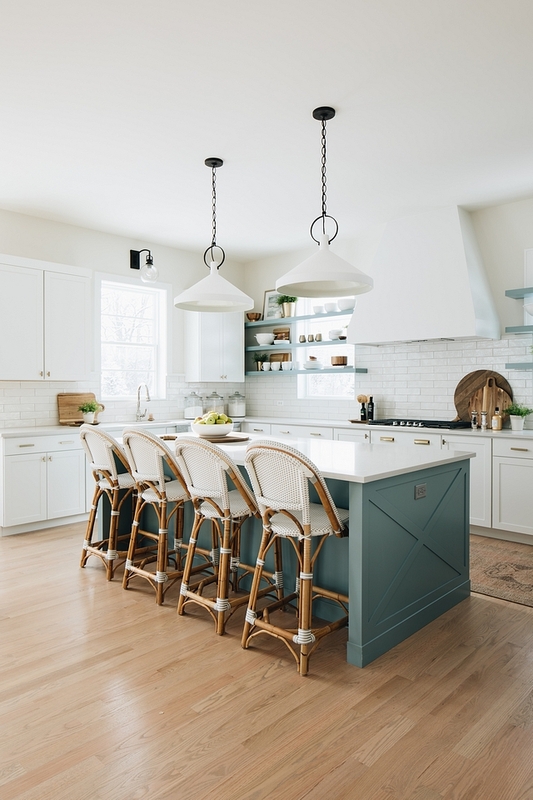 The blue ceiling is also painted in James River Gray by Benjamin Moore. Rug: HomeGoods – Other Neutral Rugs: here, here, here, here, here, here, here, here & here. 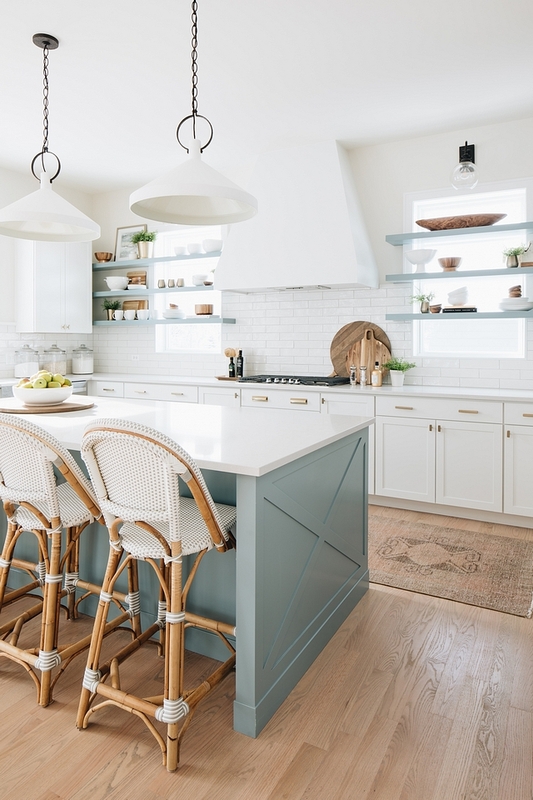 “Once the ceiling detail of shiplap and white beams went up, I instantly thought we needed a basket type color up there. 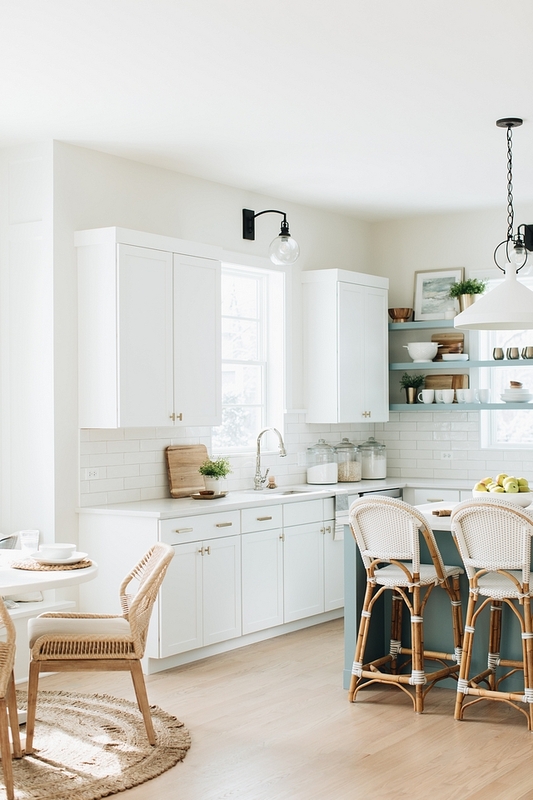 The light fixtures were the perfect beachy choice to really draw your eye up. When that much work goes into a ceiling detail, I always want to make sure it is seen!” – Julie Howard. Rug – McGee and Co – similar here. Console Table – Joss and Main. 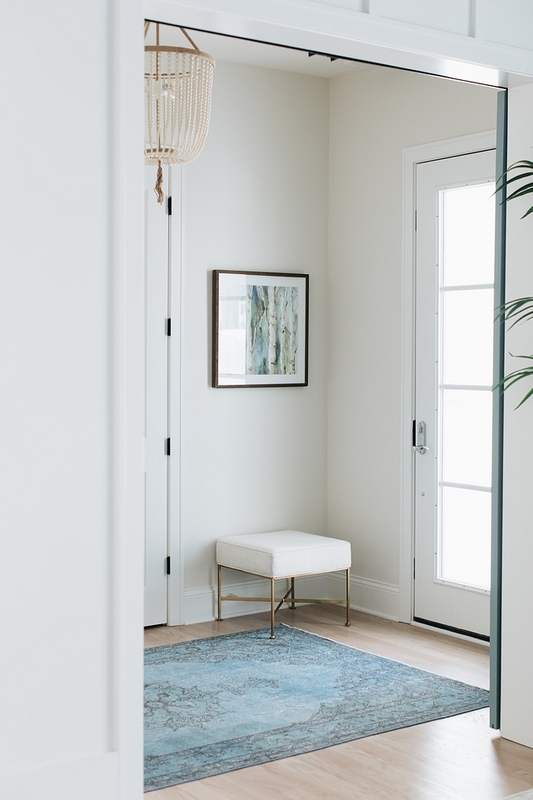 This hallway also features an inviting window-seat. Ceiling light fixtures are from Serena and Lily. Pillows: Linen, Patterned – similar & Lumbar Pillow (similar here & here). 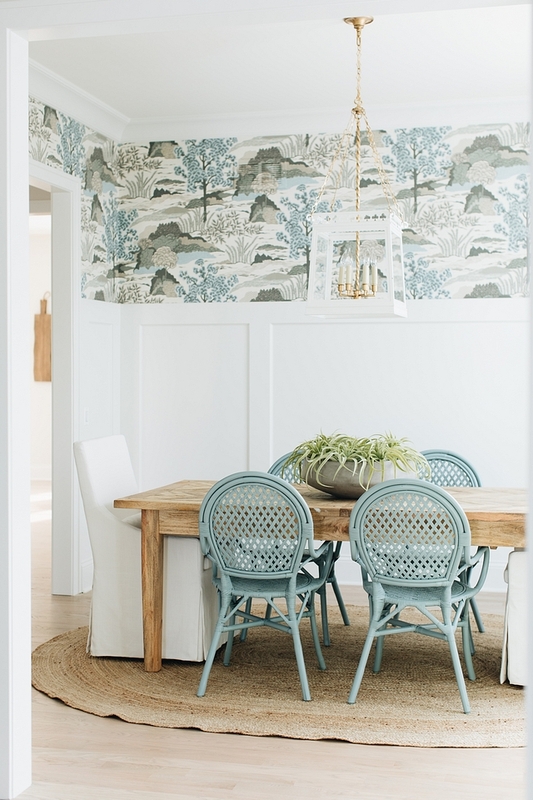 A dreamy dining room is located just across from the foyer, at the end of the hallway. The dining table belongs to the designer and it’s an older table. Other Beautiful Dining Tables: here (very similar), here, here, here, here, here & here. 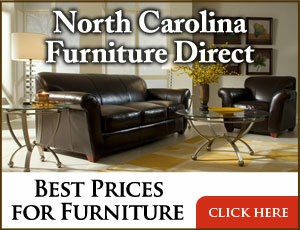 Host Chairs – RH – similar here & here. 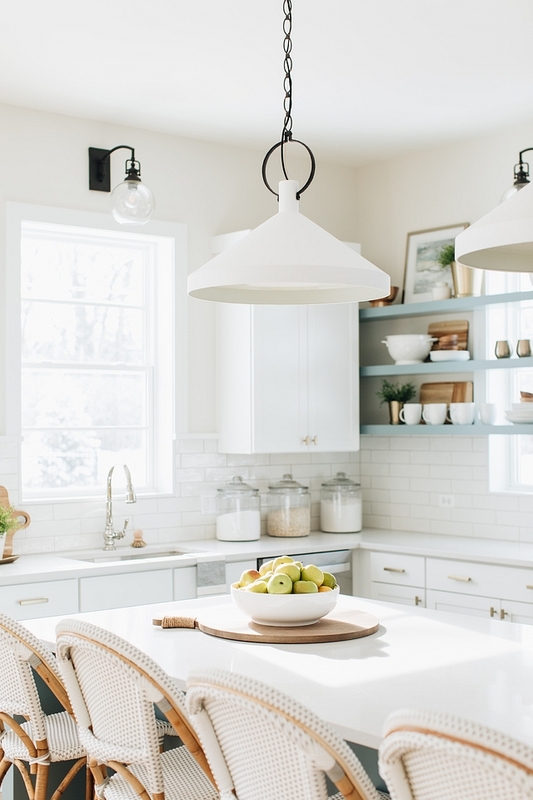 Light fixture – Visual Comfort custom color – Other Beautiful Lighting: here, here, here, here, here, here, here, here & here. Beautiful Bowls: here, here & here. “I selected this wallpaper after all the colors were selected. It just happened to have the PERFECT shades to tie the whole house together. 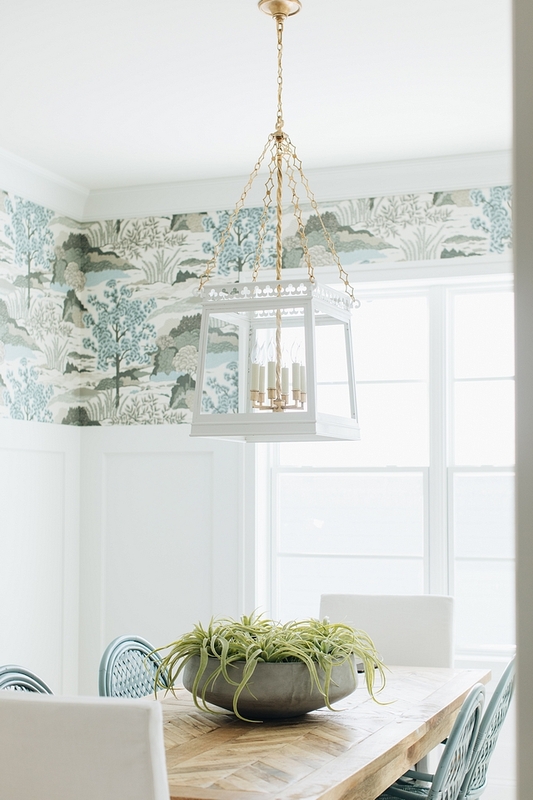 Every contractor that entered the house was sure to tell me how much they loved the wallpaper. That never happens as they usually have a lot of opinions about choices like that. I could not have been more thrilled the day it went up. The whole house was tied together. I think people underestimate the power of wallpaper. 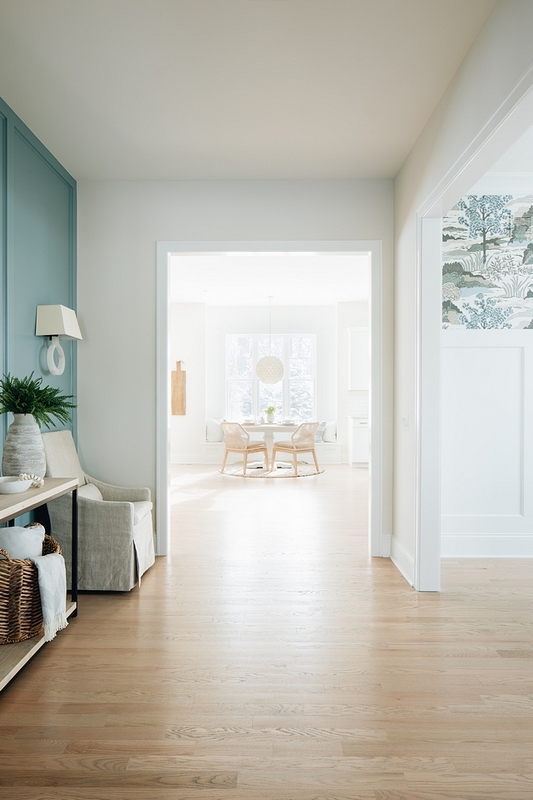 It really should not be cut from the budget because it’s usually one of the most memorable parts of any design.” – Julie Howard – interior designer for Timber Trails Development Company. Wallpaper – Thibaut Daintree in Aqua (available through the designer) – Other Beautiful Wallpapers: here, here & here. The wicker chairs were old and the designer painted them BM James River Gray. Beautiful Side Chairs: here, here, here, here, here, here, here & here. 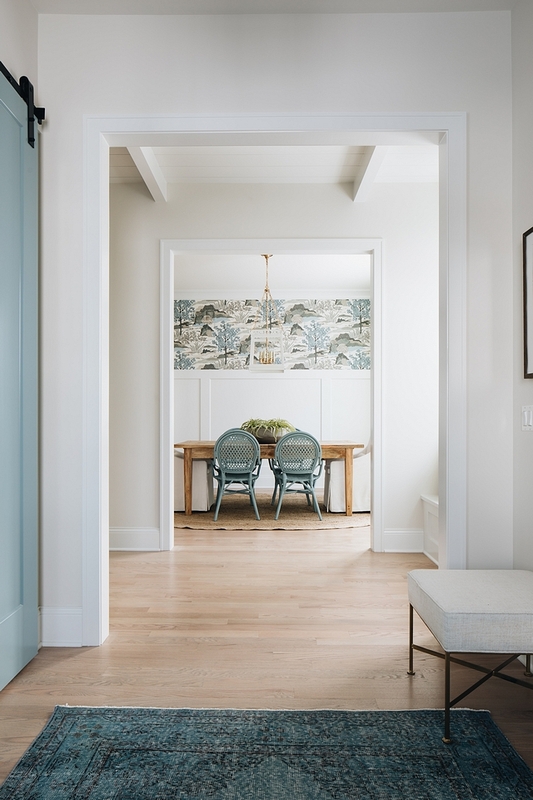 This home features many inspiring ideas, which include this stunning paneled accent wall. 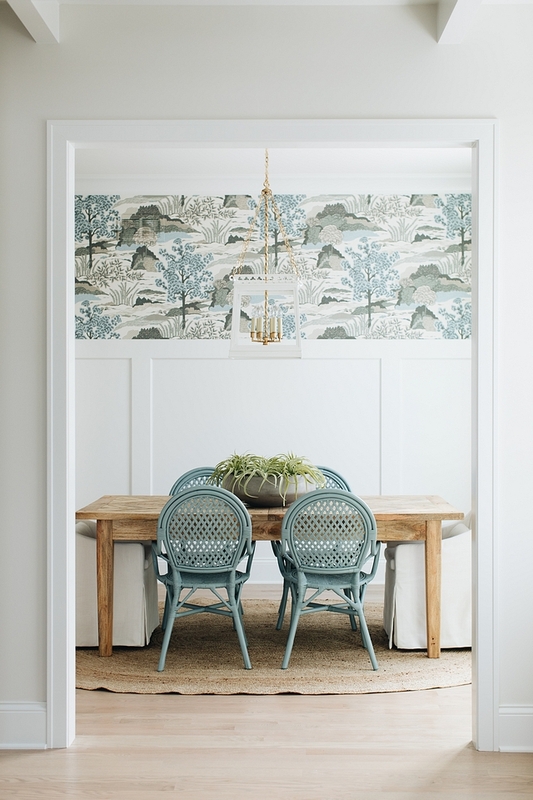 The accent wall is located just outside the dining room and it’s painted James River Gray by Benjamin Moore. 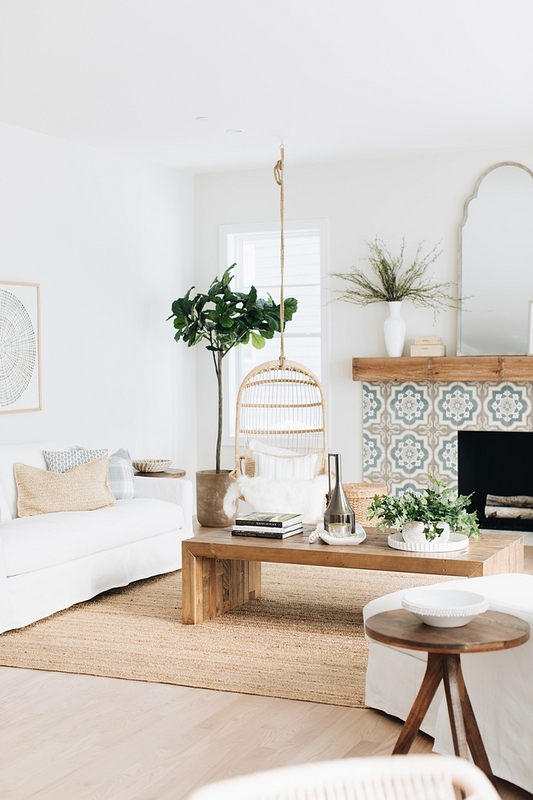 Artwork, accessories – Homegoods – Similar Options: Basket, Vases, Faux Greenery, Artwork, Candle Holder. Console Table – Walter E Smithe – similar: here. Chairs – RH in Linen – similar here, here & here. Sconces – Alabaster Sconce from Visual Comfort. Hardwood flooring is Oak hardwood floor with a custom finish – similar here & here. 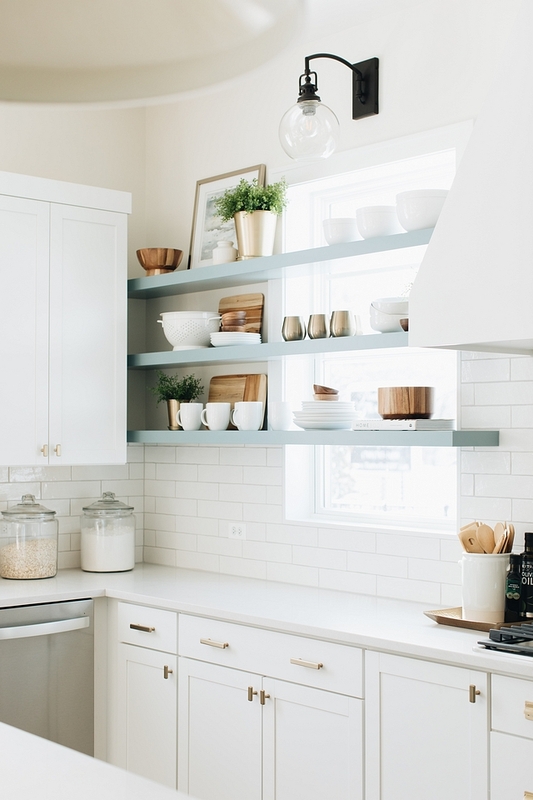 This kitchen is full of innovative ideas! 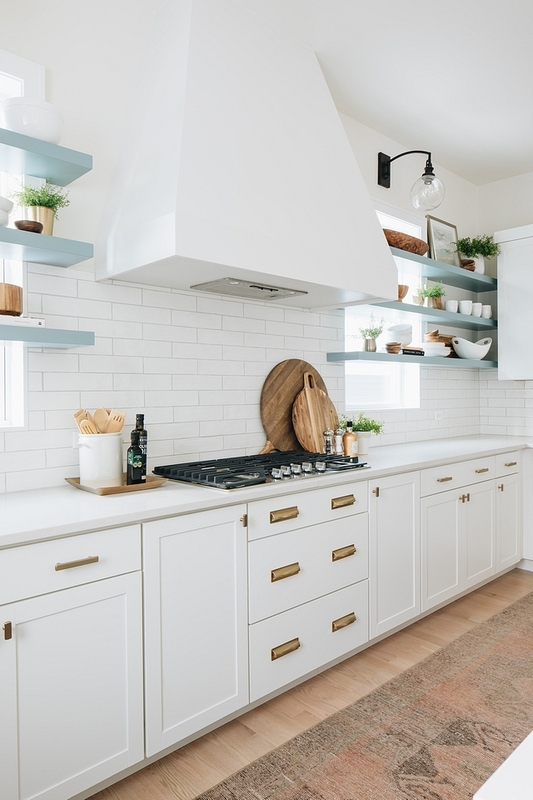 It features custom cabinets, custom floating shelves and an impressive hood. Notice the wooden boards on the right side. I am loving this! This large kitchen island is custom designed with X detail on side wing walls. 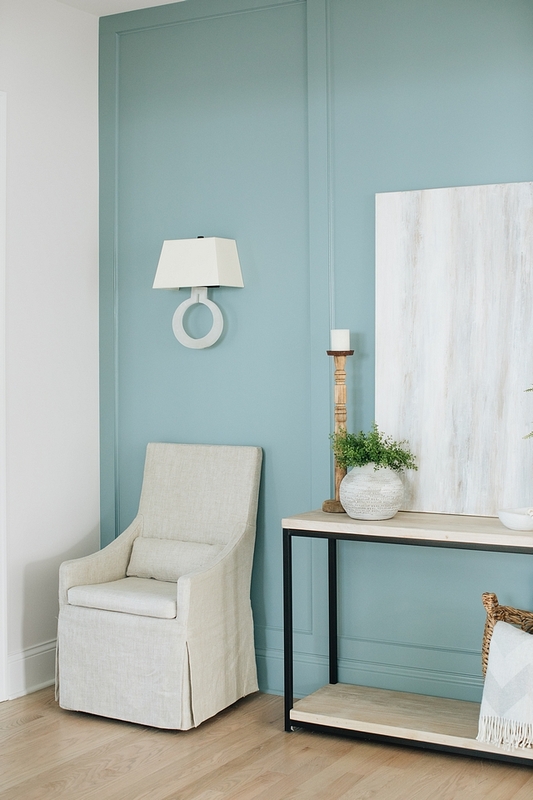 Blue color on Island is James River Gray by Benjamin Moore. 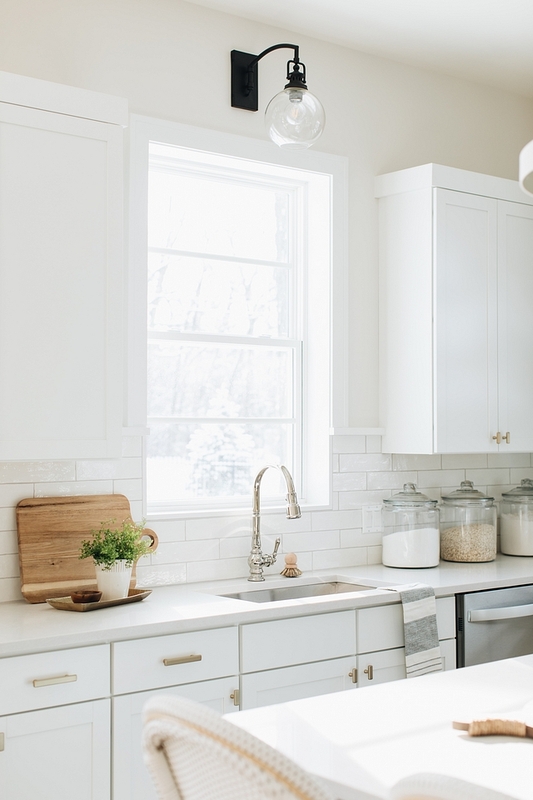 Countertop is Caesarstone’s new color; Organic White. Wall color is Benjamin Moore Classic Grey. Kitchen Faucet: Kohler Artifacts faucet in polished nickel. Runner is one-of-a-kind from Etsy – Other Runners: here (vintage), here, here, here, here, here, here & here (washable). 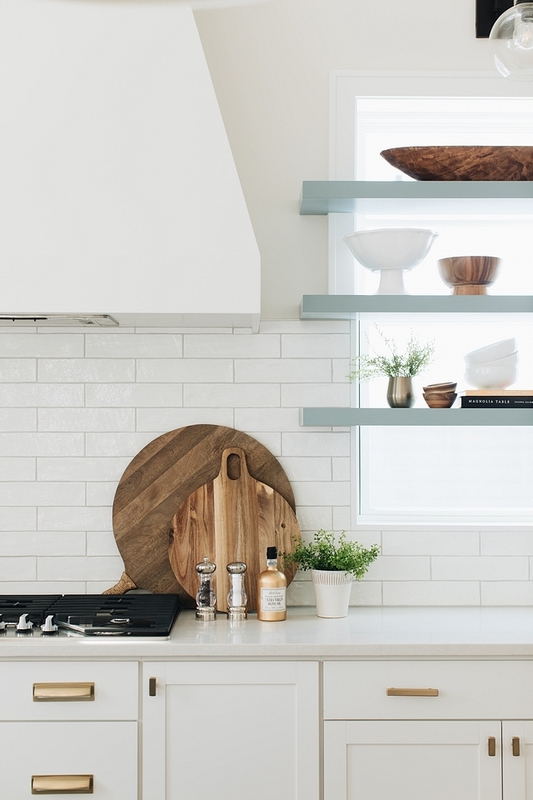 Flanked by open shelves, the sleek hood becomes the focal point for this kitchen. 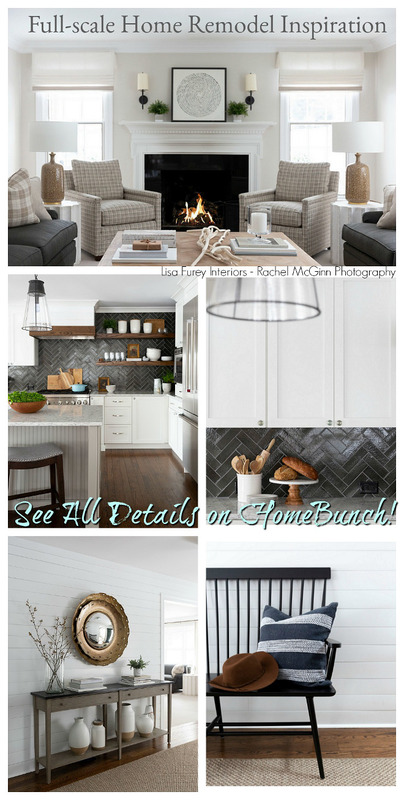 Backsplash – hand-painted subway tiles – similar. Cutting Boards: here – similar. Hardware: Knobs, Bin Pulls & Pulls. 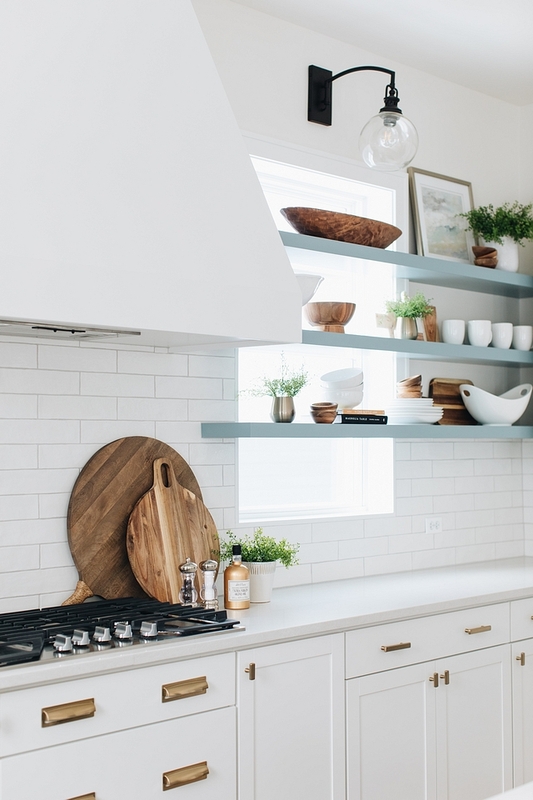 “I knew I wanted the element of floating shelves in this kitchen but couldn’t really find a good spot. The horizontal lines on the windows inspired me to take the shelves all the way across the windows on the main wall of the kitchen. 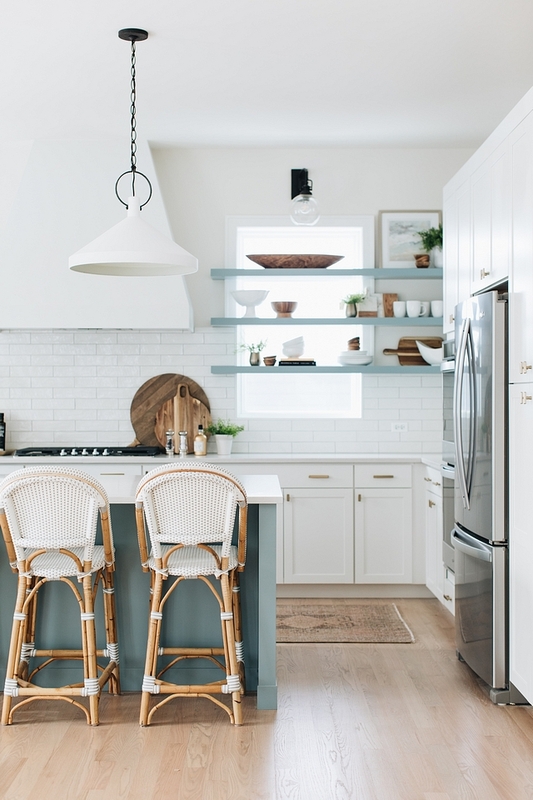 When we solidified the beach theme the color I choose for the island and shelves was the next decision. The color is actually far darker and more grey in person than in the photos. 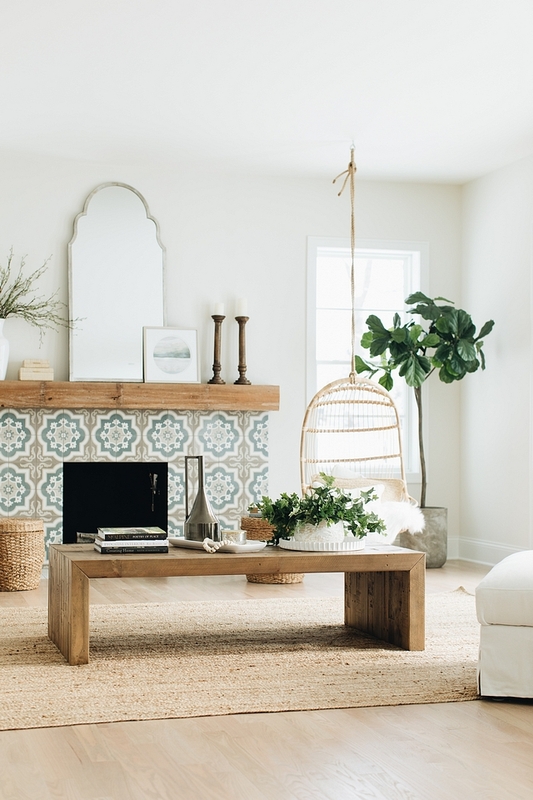 I based the color of the island on the tile I chose for the fireplace.” – Julie Howard. 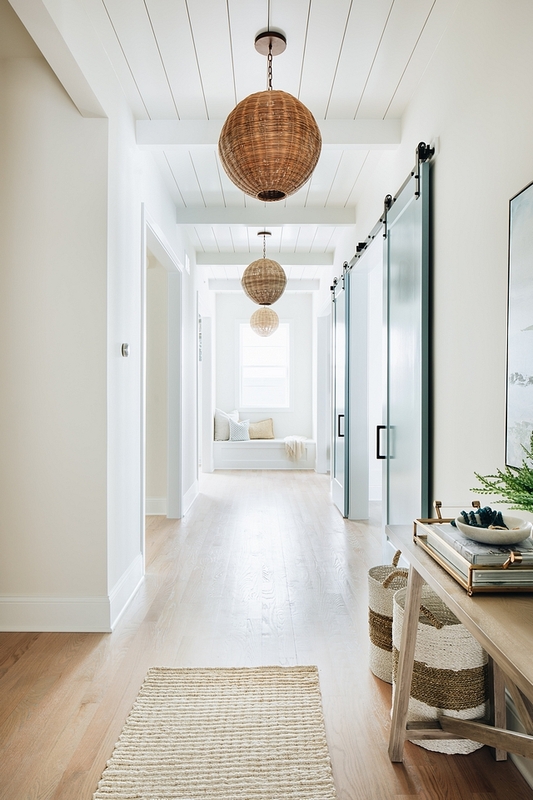 Sconces over windows – Pottery Barn. 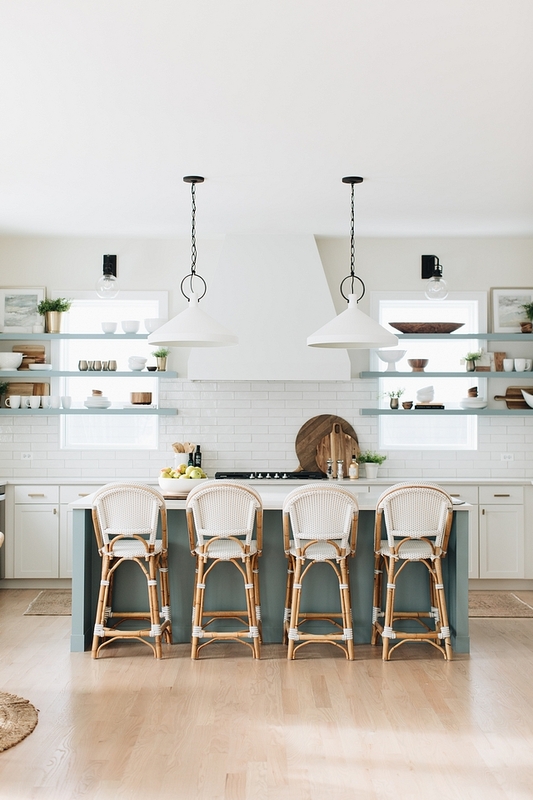 Blue color on Island and floating shelves is Benjamin Moore James River Gray. Pendants are Visual Comfort (Large). Other Pendants: here, here, here, here & here. The counter stools are from Serena and Lilly. 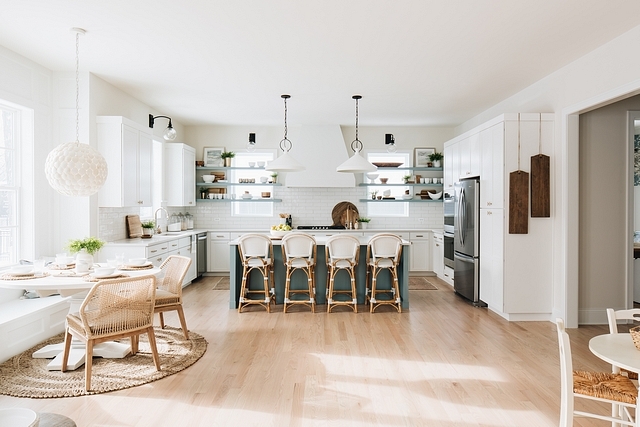 The kitchen, breakfast nook and family room are open and feel connected to each other. 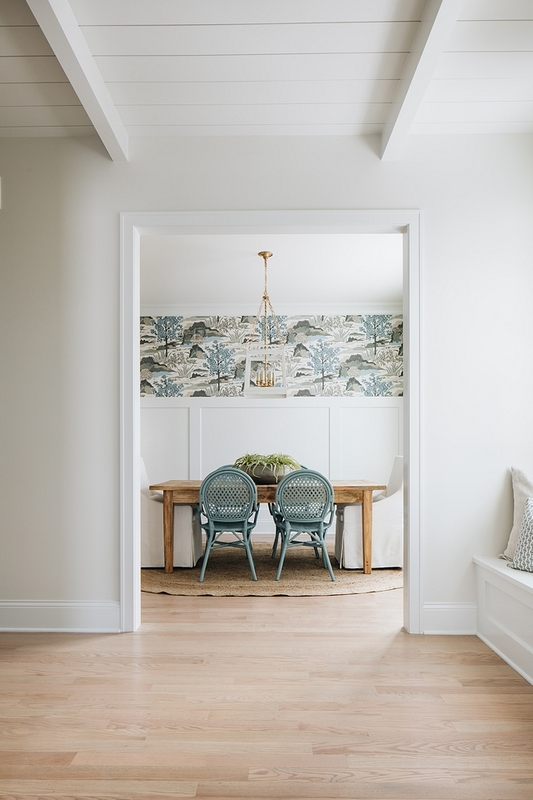 The breakfast nook features a built-in banquette with custom board and batten trim. 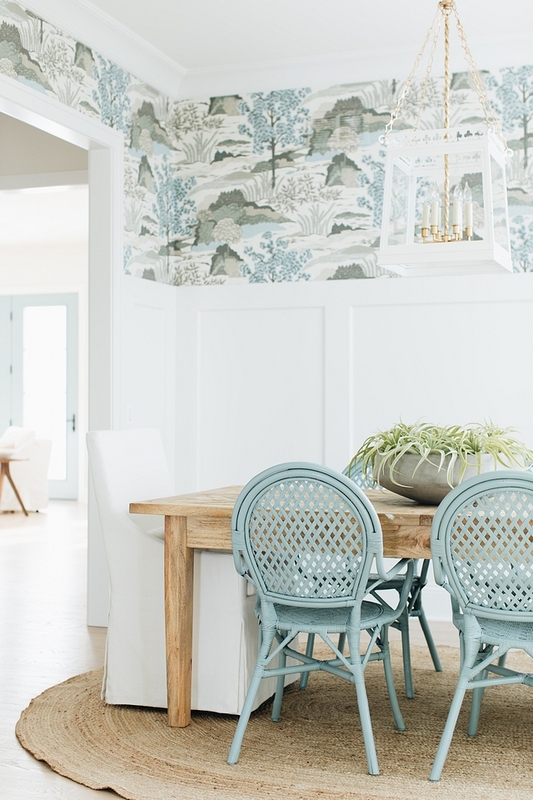 Dining Table: Joss & Main – custom-painted in white to match cabinets – similar here, here & here. Rug is from Joss and Main. Chairs – One Kings Lane. 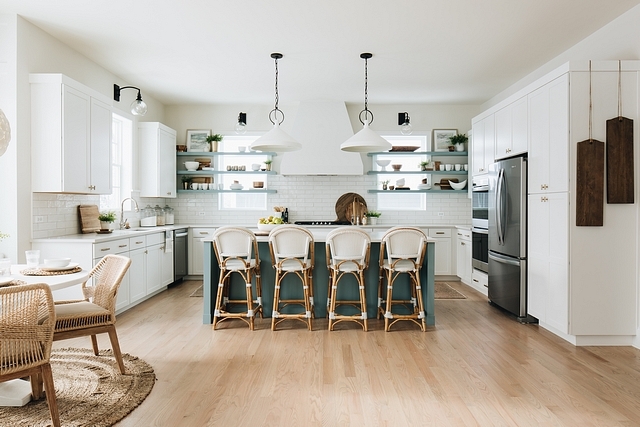 Pendant over table – Ballard Design – similar here & here. Pillows: HomeGoods – similar here. 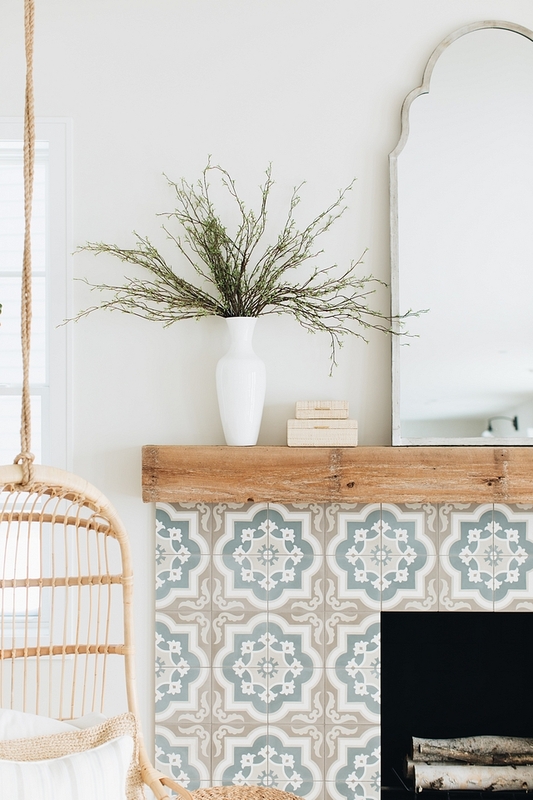 “The tile of the fireplace was the color inspiration for the whole house. 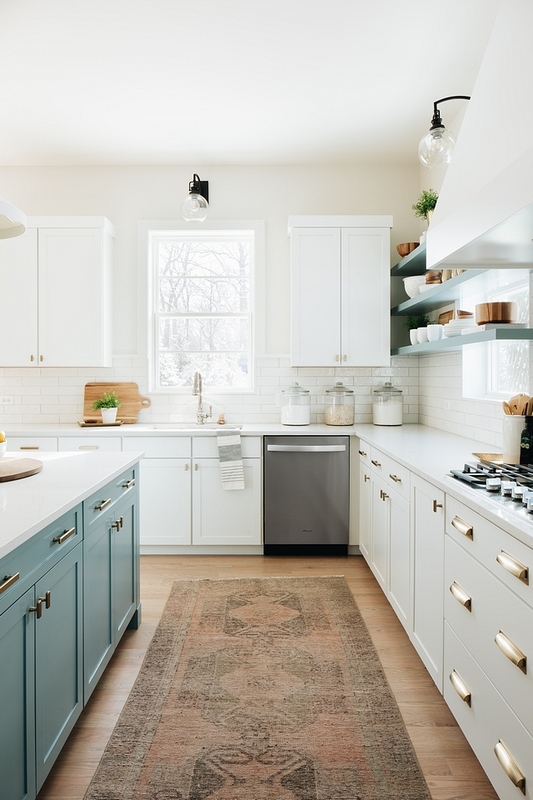 Tile is often the first decision about color I make so it’s usually the jumping off point.” – Julie Howard. 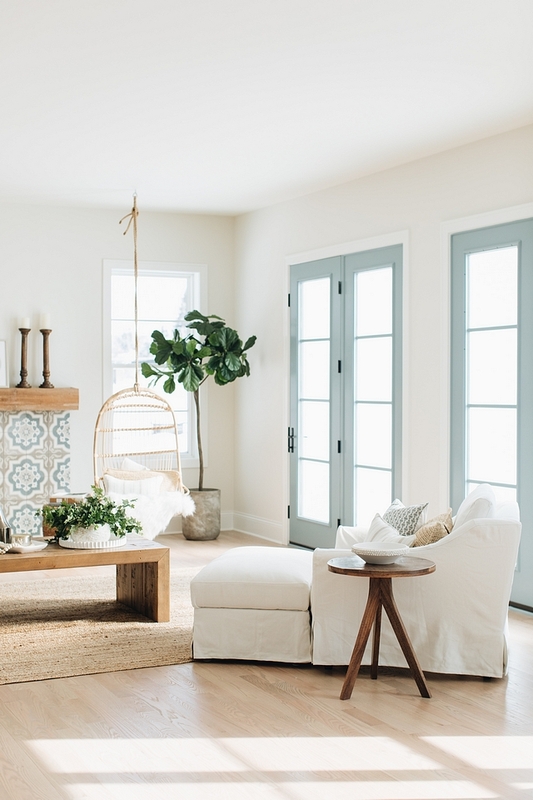 The French doors were custom-designed and painted in Benjamin Moore James River Gray. Arm Chair with Ottoman – Ikea – similar: chair & ottoman. 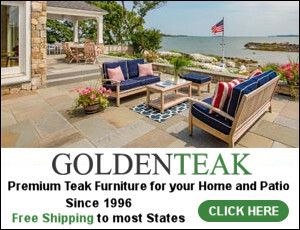 Accent Table – Homegoods – similar here. 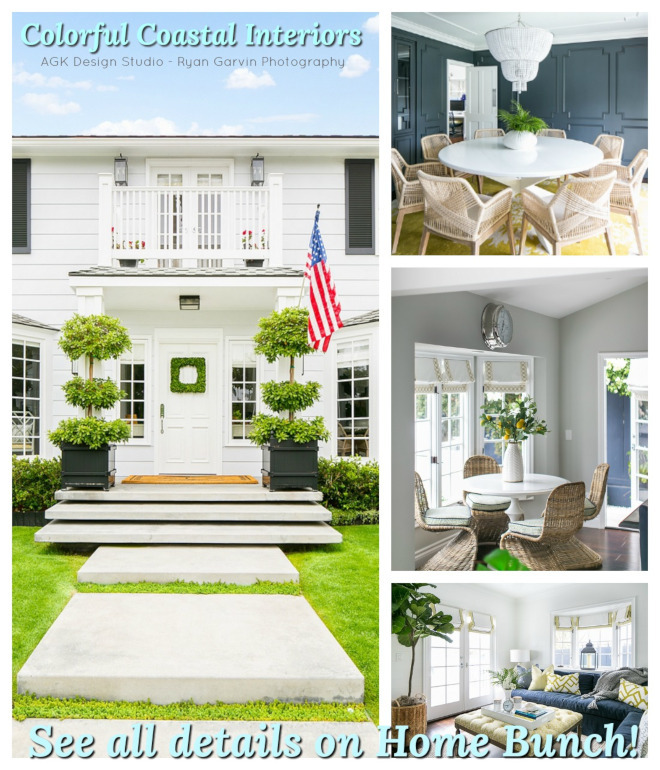 Paint Color: Benjamin Moore Classic Grey. 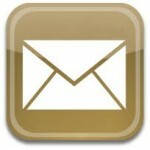 Mirror: here & here – similar. 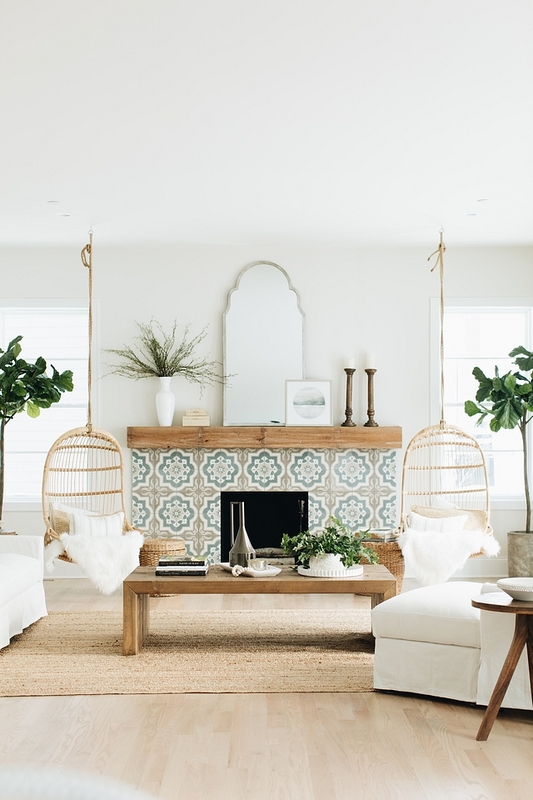 Fiddle Leaf Trees: here – similar. This coffee table with straight rectangular sides is from Wayfair. Sofa is from Ikea – similar here & here. 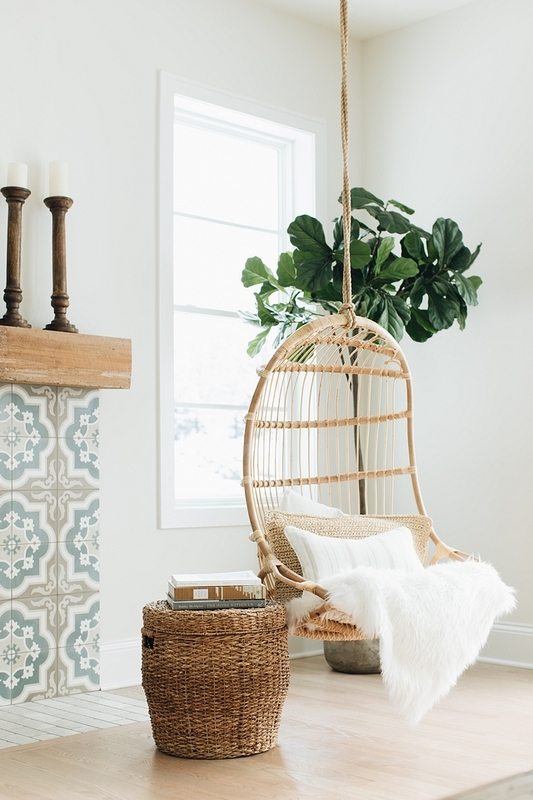 Can you imagine how fun it would be to have a pair of hanging chairs in your home? These are from Serena and Lilly. Lidded Baskets next to chairs – Target (no longer available) – similar here & here. Mantel features a reclaimed beam. 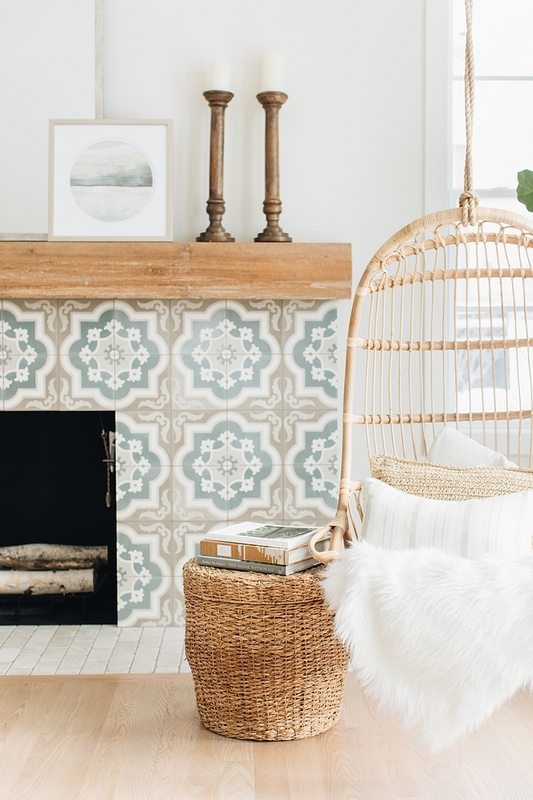 Tile is from The Tile Shop – Cement Encaustic Tile – Similar: here. 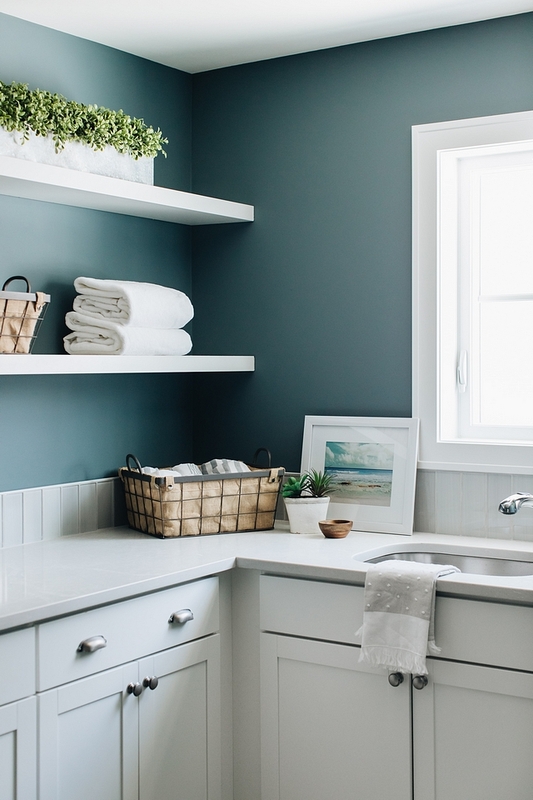 This gorgeous laundry room features semi-custom cabinetry and fun floating shelves design! Tile: Wood-grain porcelain tile in herringbone pattern. Wall paint color is Benjamin Moore AC-24 Charlotte Slate. I am loving this bathroom. It feels unique and it’s full of great ideas! Floor tile is combination of 3 colors of Penny Tile – the tile installer created the pattern on site. Black mirror is from HomeGoods – similar here. Hardware is Flat Black by Top Knobs. 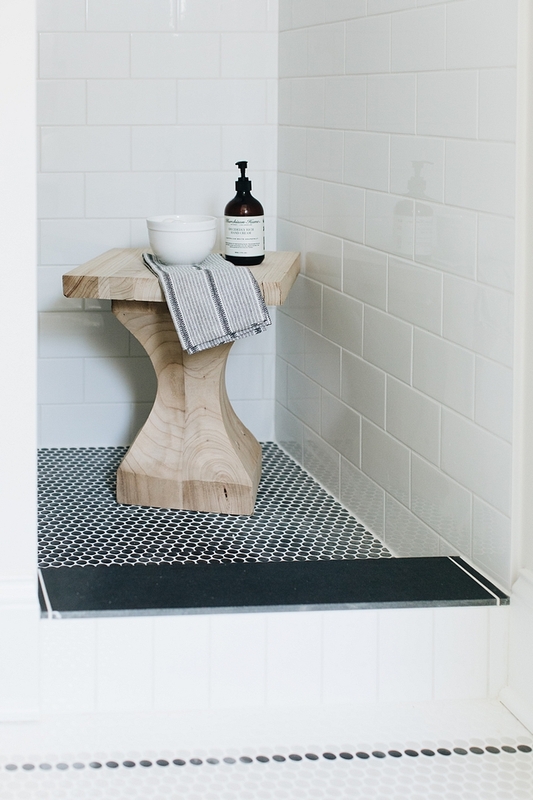 Create this Look: White Penny Tile, Gray Penny Tile & Black Penny Tile. Wall color is BM Classic Gray. Shower features the same black Penny tile on shower pan and a white subway tile on walls. 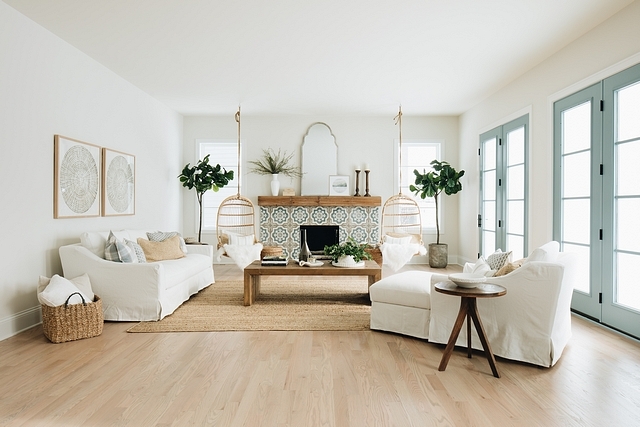 Floor is a light wood tone ceramic tile – similar here. 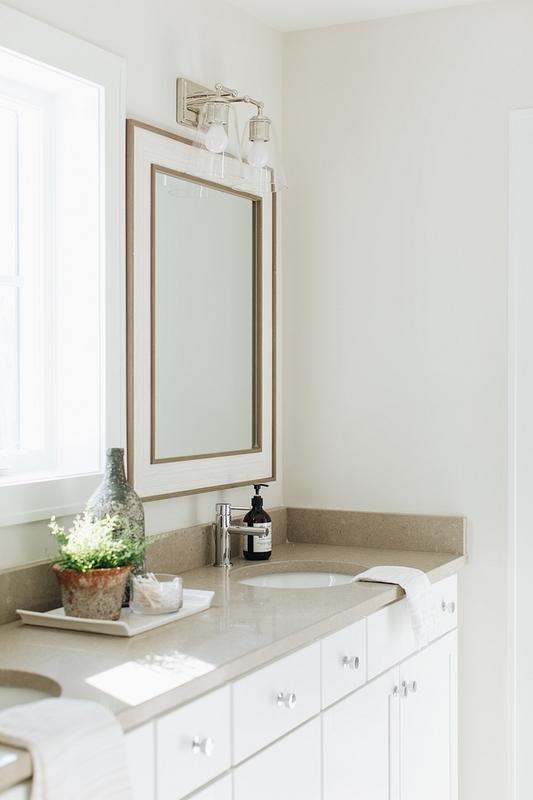 Mirrors are from Homegoods – Other Beautiful Mirrors: here, here, here, here, here, here & here. Countertop is Caesarstone in Shitake. 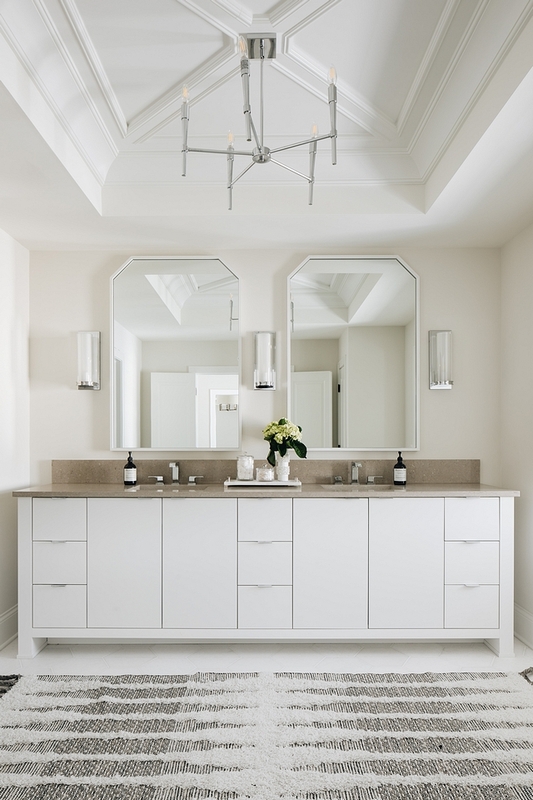 “The color combination of the white Carrara marble and the taupe limestone were the perfect beachy look for this bathroom.” – Julie Howard. 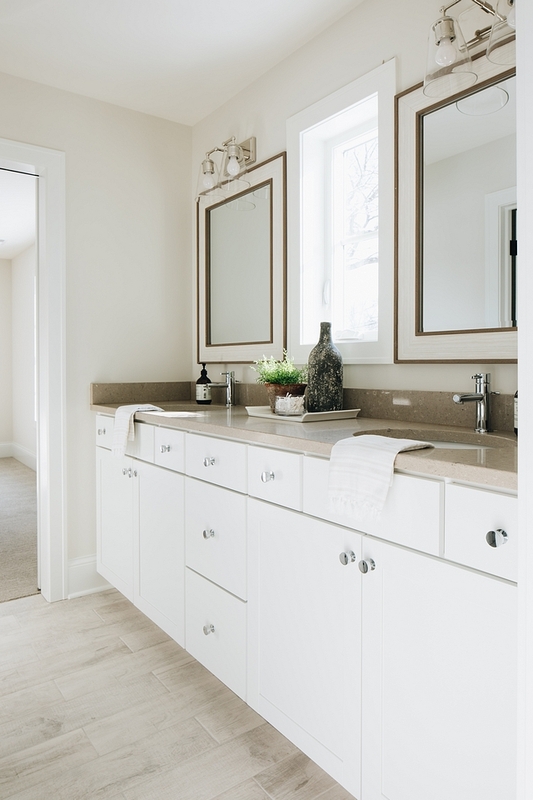 Cabinets are custom designed – Other Beautiful vanities: here, here, here & here. Cabinet Hardware: Top Knobs in Polished Chrome. Mirrors were custom made on site. Wall paint color is BM Classic Gray. Notice the ceiling trim work. Sconces are from Pottery Barn and chandelier is from Joss and Main. 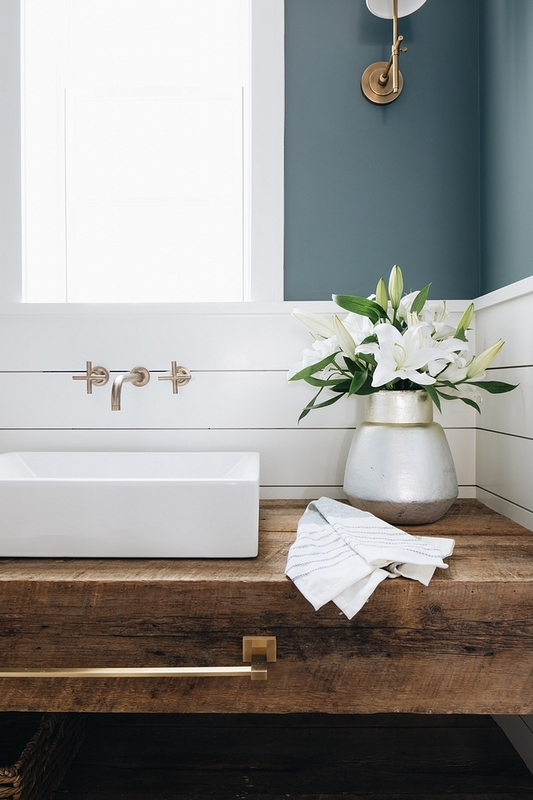 The bathtub is a freestanding pedestal-style Kohler Sunstruck tub. I loved creating the stripe pattern in the shower to look like wallpaper above a chair rail. 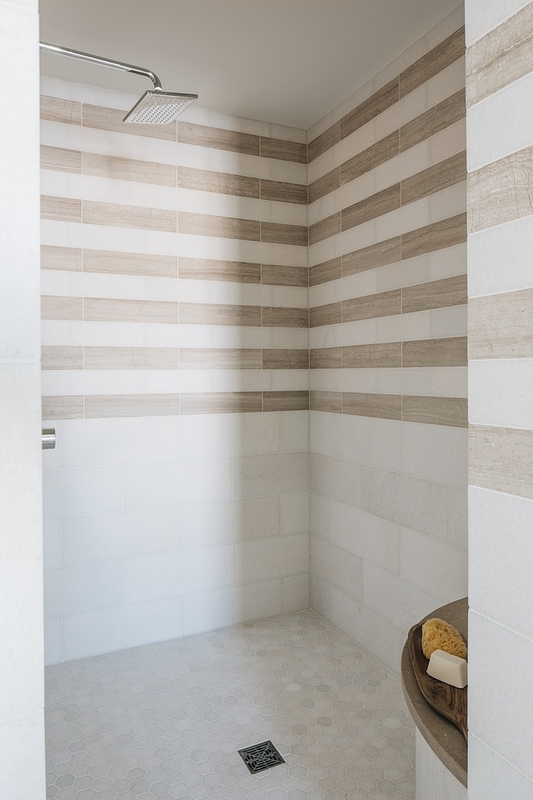 There are so many details in this master suite but the shower tile detail is my favorite.” – Julie Howard. 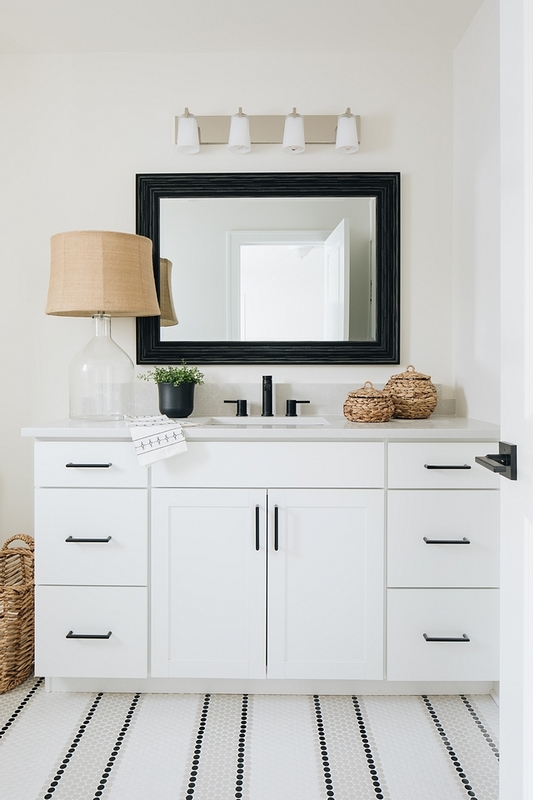 This powder room deserves a pin! Isn’t it gorgeous? 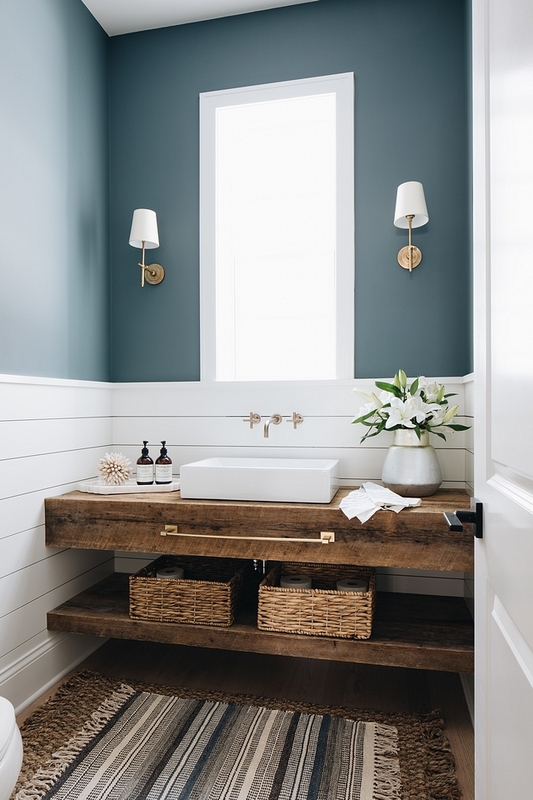 It features shiplap wainscoting and a custom floating vanity made out of reclaimed wood. Rugs: Jute – Moroccan Rug (similar). 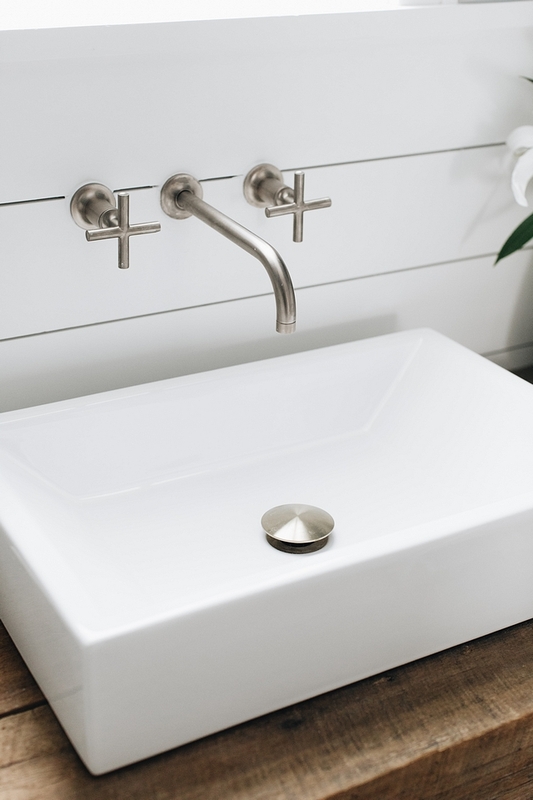 Faucet – Kohler Purist in Brushed Bronze. Vanity is made on site using reclaimed wood. Wall paint color is Charlotte Slate AC-24 by Benjamin Moore. 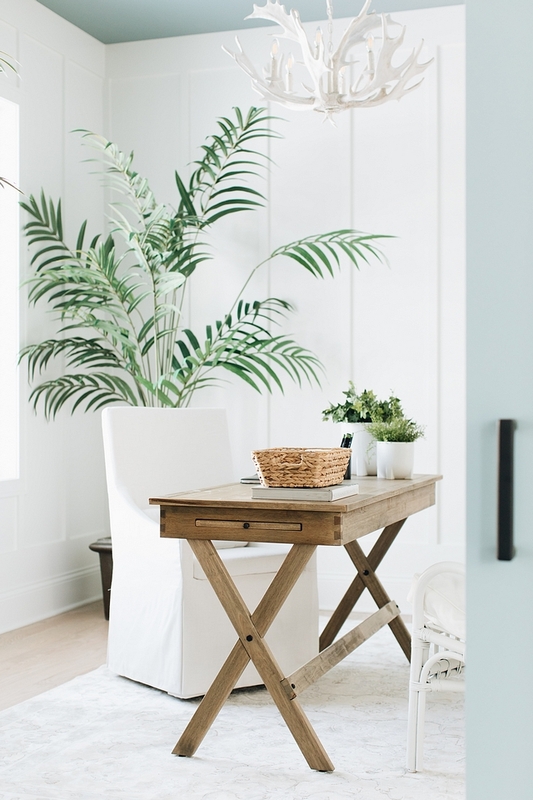 This mudroom feels so peaceful! 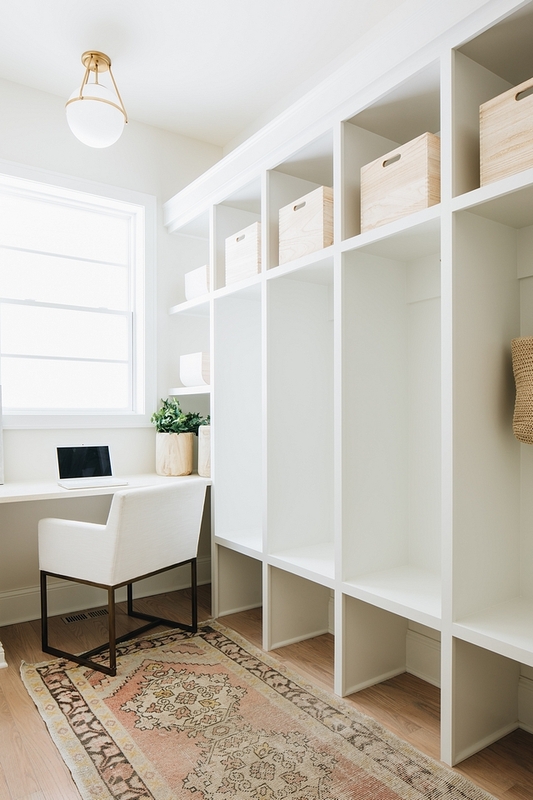 It convinently features a custom built-in desk and plenty of cubbies. 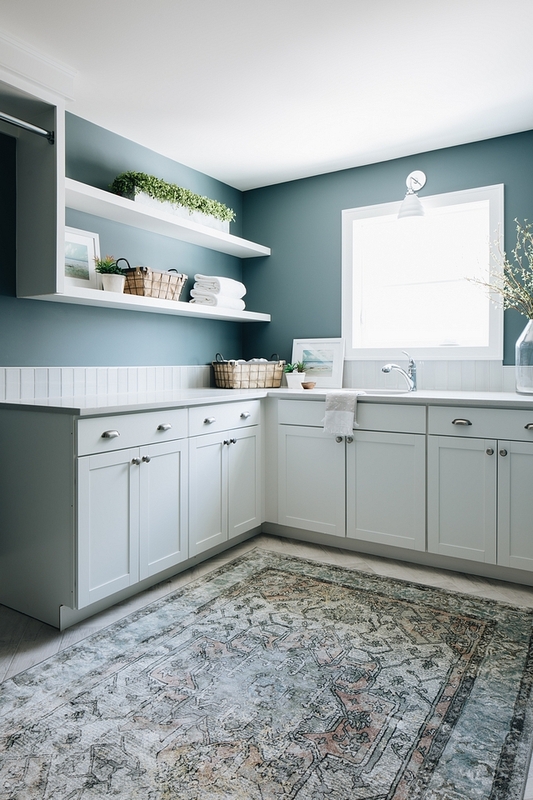 Mudroom Paint Color: Benjamin Moore Classic Gray (on walls). 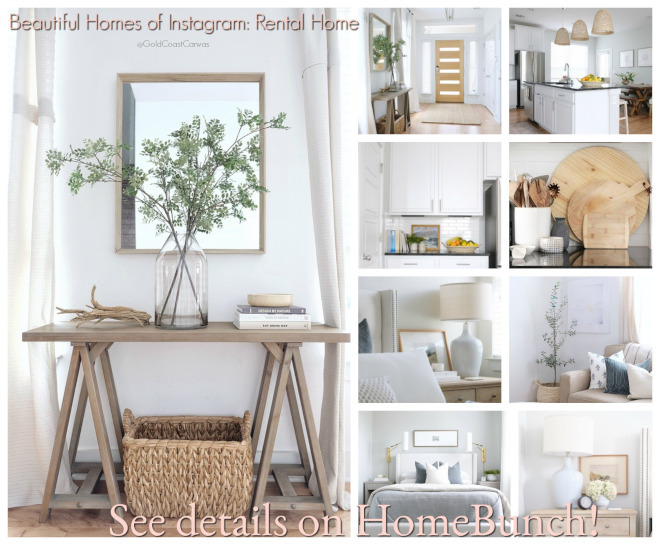 Beautiful Homes of Instagram: Rental Home. Beautiful Homes of Instagram: Horse Farm. 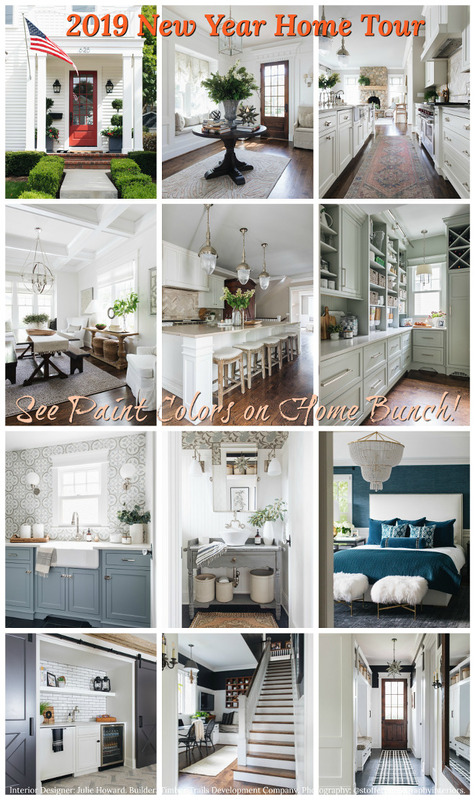 Interior Design Ideas: Colorful Interiors. Classic Colonial Home Design.